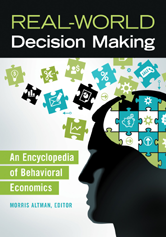 A leading authority on behavioral economics, Morris Altman and other expert contributors delve into key concepts in behavioral economics, economic psychology, behavioral finance, neuroeconomics, experimental economics, and institutional economics to help inform economic models based on reality, not theory. Through informative entries, the book explores various aspects of the subject including decision making, economic analysis, and public policy. In addition to introducing concepts to readers new to the subject, the book sheds light on more advanced financial topics in a manner that is objective, comprehensive, and accessible.